If your dentures break, there is no reason to panic. It is fairly easy to repair dentures than you might assume. Broken dentures will make the challenge of talking and chewing that much more difficult. What matters most is that you reach out for assistance without delay. We can examine your dentures, determine if repairs are possible and get to work on returning these artificial teeth to functional condition. The dentist might take an impression of your mouth in order to perform a denture repair. If the denture break is beyond repair, this impression will likely be necessary to form a new denture. The chances for denture repair hinge on the degree of damage. It is possible to remedy some cracked dentures with bonding. The bonding process fortifies the cracked portions so the dentures function properly. However, a significant break will prove quite challenging. While it may be possible to repair a broken denture, it will not be as strong as before. Cracked dentures are typically repaired in dental labs. After repairs, dentures match the current shade and shape of the teeth for aesthetic uniformity. If the dentures merely have a diminutive chip, it might be possible for the dentist to smooth it out on-site without any assistance from the lab. What matters most is the chip size and location. So be sure to visit your dentist as soon as you notice the break or chip in your dentures. The dentist will evaluate your dentures and provide you with advice for treatment. Even if it is not possible to repair the denture on-site, the dentist will send it off to a dental lab for a fast and thorough repair. What Happens After Repairing the Denture? If it is possible to repair the damaged denture, the dentist will perform the correction and adjustments as necessary. If the assistance of professionals in the dental lab is necessary, you will pick up the dentures at this facility. In certain instances, we can repair dentures and have them ready for pickup in a day's time. However, most such repairs require at least a day or two to complete. This means you will be without your dentures for 24-48 hours, so prepare accordingly. What About DIY Denture Repairs? If you attempt to repair dentures on your own, you will likely make a mistake that only makes the issue worse. 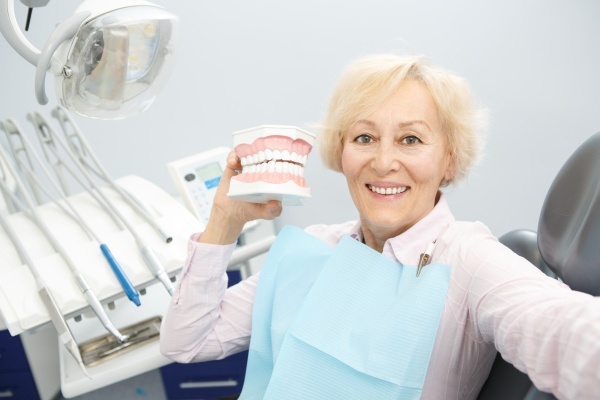 While a broken denture certainly qualifies as a “desperate time," attempting to execute a “desperate measure” on your own will cause even more harm to your dentures. It does not matter if you own a home denture repair kit or any other tools that will help repair the broken denture. There is no sense trying to perform a DIY repair when such an attempt might end up increasing the damage. For more information or to schedule an appointment with GK Dental PC, request an appointment in our Everett dental office here: https://gkdentaloffice.com. Or call us at (617) 826-6075. « What Can Happen When You Don’t Replace a Missing Tooth?